Number 6 on my best resources for learning animation list is 11 Second Club. 11 Seconds Club provides monthly competitions for animators, it is a great resource to push you to the next level. The concept is to take an audio track, that the web site provides for you, and create an acting scene based off the audio. You have a month to produce a clip and upload it to the web site. The web site requires you to be discipline by hitting a submission deadline and generate unique acting choices within an audio track. The community then rates the submissions, while providing constructive feedback and comments. 11 Seconds Club is not meant for the faint of heart, and you need to have tough skin (which all animators should have). Since it is an “open forum” sometimes commenters don’t pull any punches, but what makes you cry only makes you stronger. 11 Second Club’s format might scare off “newbies” to animation, but when you are good and ready post a submission! But, if you are not there yet watch the submissions and use their online forum! By watching animation, you will train your eye to see things that others don’t. Go to 11 Second Club. KennyRoy.com is number 5 on my best animation resources list. I am kind of a kennyroy.com fan boy so take this with a grain of salt. I would suggest supplementing your online animation schooling, or college education, with KennyRoy.com. The website is affordable for students and provides great resources like lectures, and weekly mini lectures, an online forum, etc… The weekly lectures generally take about 15 minutes. Kenny Roy also posts a monthly full hour animation lecture onto the website. He generally picks topics that he sees students having issues with, or questions that the community asks him. I have written a full review, the pro’s and con’s of kennyroy.com. Read my review by clicking here. 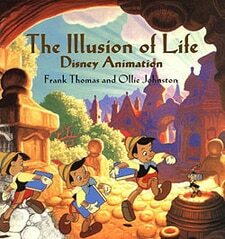 Number 4 on my best resources for learning animation list, The Illusion of Life by Frank Thomas and Ollie Johnson. The Illusion of Life is a beautiful book. You will be blown away by the graphics in this book. Learn the basics of animation from lessons of two animation masters and founders Frank Thomas and Ollie Johnson. Read more about this book and others in my 10 best animation books list. Click Here to Continue on and See My Top Three Animation Resources!